Royal Plecos are truly magnificent show fish. It is often written that their striking juvenile colours fade with age, but I've seen 14" adults that puts paid to that theory. Colouration aside it is probably their unusual shape and utterly graceless movement - akin to a swimming rock - that endear them to many aquarists not usually interested in secretive catfish. Indeed secrecy is the fishes main drawback. Once settled the fish will make occasional forays for food and this bravery increases with age but youngsters however can be considered nocturnal. They tend to cling to their beloved shady refuge for most of the day, movement only precipitated by intrusion of another fish into this sanctuary. The Royal Pleco's wide geographical range also gives us some interesting colour variations which may someday be described as further species. There is a gold stripe variety with a black background colouration (shown below), the shade of green ranges from olive to near blue, and the amount of black background colouration in relation to the stripes varies greatly. Some individuals have striped pectoral and pelvic fins, others are plain. Some sport entirely clear caudal fins, others have a clear half moon shape. In all these variations the distinctive red eye doesn't remain a constant either. 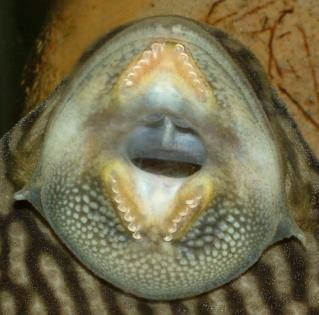 All members of the genus Panaque have very distinctive teeth. The underside of the sucker mouth is quartered and on each quarter (or ramus) lies a slanted row of 6 - 8 spoon shaped teeth. The four rows of teeth are slanted in such a way around the mouth as to give the appearance of a rhombus with the mouth at the centre. These teeth are put to good effect when rasping algae from all surfaces, so much so that they will soon scratch plexi-glass tanks and you should keep an eye on the silicon at the corners of glass tanks. Whilst moving a 6" P. nigrolineatus, I kept it in a large polystyrene shipping box. Alarmed by a squeaky scratching noise coming from the box, I went over to investigate, but the noise stopped. I repeated this, rather comically, and at every approach the noise, again, stopped. Eventually, by standing very still over the box, I discovered the noise was the Royal Pleco grazing from the polystyrene base! Although primarily vegetarian these fish will also take fish meat from time to time. Certainly mine would not shy away from the occasional frozen prawn, but the bulk of their diet was vegetable scraps taken from the kitchen, then attached to a rock near the fishes chosen refuge. On the topic of feeding, it is quite common to find young Royal Plecos offered for sale in a terribly undernourished state; they require dedicated attention should you decide to purchase them. This can be achieved by quarantining them until they are feeding regularly and their body fats are restored. This is best accomplished in a bare tank - unpopulated except for the patient - and it should include a large piece of bogwood for refuge. Heavy filtration, alongside frequent feeding and water changes should be utilized to bring the fish round. Irrespective of the state of the fishes belly, individuals offered for sale with sunken yes almost invariably do not respond to this treatment and seem to be "too far gone" to be saved. Etymology The generic epithet "panaque" is a Venezuelan common name for this fish. nigro = black; lineatus = lines or stripes alluding to the fishes black stripes. Size 430mm or 16.9" SL. Find near, nearer or same sized spp. These fish are imported in all sizes and in a number of colour forms. Interestingly the colour of the eye varies from bright orange to dull red. Although described from Venezuelan material, the colour forms that have given rise to L027 are from different locations such as the Rio Tocantins, Xingú and Tapajos, Brazil. It appears that the juveniles of Brazilian populations have solid or plain as opposed to barred caudal fin rays. So, a juvenile with barred caudal fin rays is from Colombian or Venezuelan stock. Sexing Undocumented, although with most ancistrine plecos the genital papilla of the female is round and blunt, that of the male by comparison is smaller and pointed. It is not known at what size this method of sexing can be used on Royal Plecos. Distribution Wide distribution range from Colombia and Venezuela to South Central Amazon basin. Furniture Bogwood is essential - both for dietary reasons and because it seems to be the Royal Pleco's preferred hide-out - although any suitably sized dark refuge will be utilized. When larger, Royal Plecos will re-arrange the tank to their own liking; ensure rocks are well secured and cannot be toppled against the glass. Compatibility Territorial with conspecifics and other similarly sized catfish although otherwise peaceful with smaller fish. This fish can be a fussy feeder and only once it is feeding well should be mixed with large, boisterous fish. Suggested Tankmates Most community fish, this fish is very secretive and so you will want more active fish around to provide something to watch. Breeding No published information exists, but I have heard that the fish has been spawned in captivity using some form of tube in a large tank (approx. 125 US Gallons). A false dry season of two weeks (low, warm, still water) was used. Then the tank was topped off with cooler rainwater (refilling about 80%). Lots of meaty and veggie foods were offered. The pair spawned within days. References Monatsb. Akad. Wiss. Berlin 1877 - pp471 - Unnumbered pl. following p. 556. Aqualog shows a number of colour variations. 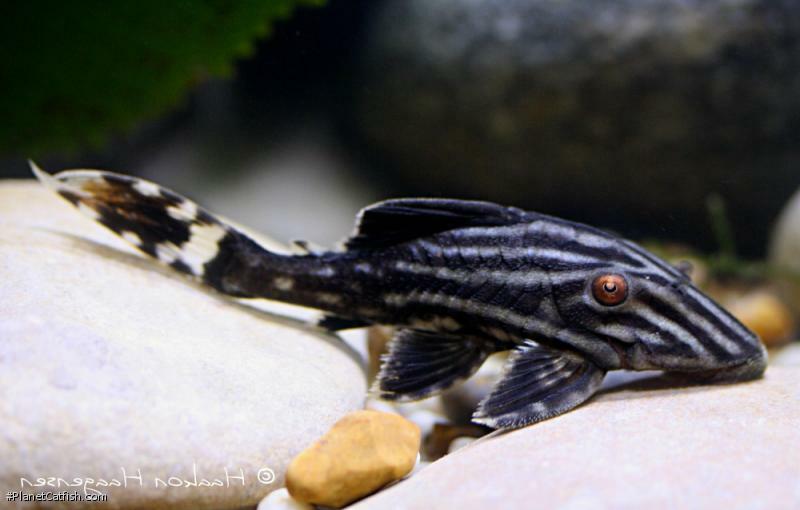 L027a (commonly known as the watermelon pleco or L330) is the spotted variety, L027b is the olive green variety and L027c is the golden variety. Whether or not these are distinct species or not remains unknown. There are 288 registered keepers, view all "my cats" data. There are 22 records of this fish being seen, view them all.